If you run in MKE, it’s likely you’ve visited one of Jessica Hoepner’s running stores – she co-owns Performance Running Outfitters with her husband, Trae. Here, you can learn more about how her love of running helped inspire her to open the stores (there are three in MKE), the gear she recommends to get through these cold and dark winter days and how being patient is helping her recover from an old injury once and for all! Favorite post-race treat: I always crave a hamburger after a hard race. Favorite shoe to run in: I have a lot of shoes! Right now, I’m doing most of my running in the Nike Elite. How did you get started with running? I ran track in middle school and high school, but my love for running really started after my best friend got me to join the cross country team. Do you have a quote or philosophy that inspires your running? Never settle. Keep pushing forward. What does a typical week of training look like for you? I’m finally feeling back to normal – I’ve been injured with a hamstring issue for a long time. Right now my training is about being consistent, doing strength work and building a base so I can start to think about racing again. 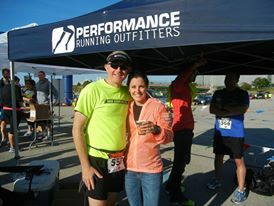 Can you tell us a bit about how and why you and Trae decided to start Performance Running Outfitters? After college, we both stayed connected with the sport by coaching at the high school level (we still do). I was also marathon training and after a series of jobs that weren’t fulfilling to me, I came home and told Trae I wanted to open a running store. He thought it would be great – we both love running and would maintain and encourage a healthy lifestyle. I had also told him previously that I wanted a bakery . . . he wasn’t as excited about that idea! How has owning three running stores impacted your own running? It only impacts it as much as I let it. When I’m healthy, I find the time to run. I tend to enjoy working a lot, so owning the stores has impacted my personal life versus my running. It always makes me think of the Chris Young lyrics “work that job but don’t work your life away”. I think business owners of any kind can really become addicted to working 24/7. There is always something that was supposed to get done yesterday. What are some of your favorite items for runners in your stores right now? Roll Recovery massager and the new Garmin 620. A lot of MKE runners are struggling with the cold, snowy, icy winter. What gear do you recommend they try to help them keep running throughout the season? If it’s icy, I actually head inside to the treadmill or Pettit because it’s not worth getting injured to me. We do sell Yaktrax for traction on ice. If it’s just cold and not icy, then wind-resistant thermal tights (or pants), long-sleeve thermal baselayer, soft shell jacket, wind/water resistant mittens, buff thermal tube, winter running hat, and wool socks. What are your running goals for the upcoming year? Stay healthy. My overall goal is to be able to jump in and run with anyone at any time. This year I’d like to get ready for a half marathon in the fall. Where are your favorite places to run in Milwaukee? Any trail that isn’t paved and along the lakefront. What is your favorite Milwaukee race? Depends on the distance! TosaFest 5k, Cudahy 10 miler, Lake Country Half Marathon and Lakefront Marathon. I haven’t raced in a few years, so there are a lot of races have been added that I haven’t had the opportunity to do. In general, what makes Milwaukee a great place for runners? The community of runners is amazing – they’re encouraging and friendly. We also have a lot of great cross country and track programs with coaches that promote and teach running as a lifelong sport. 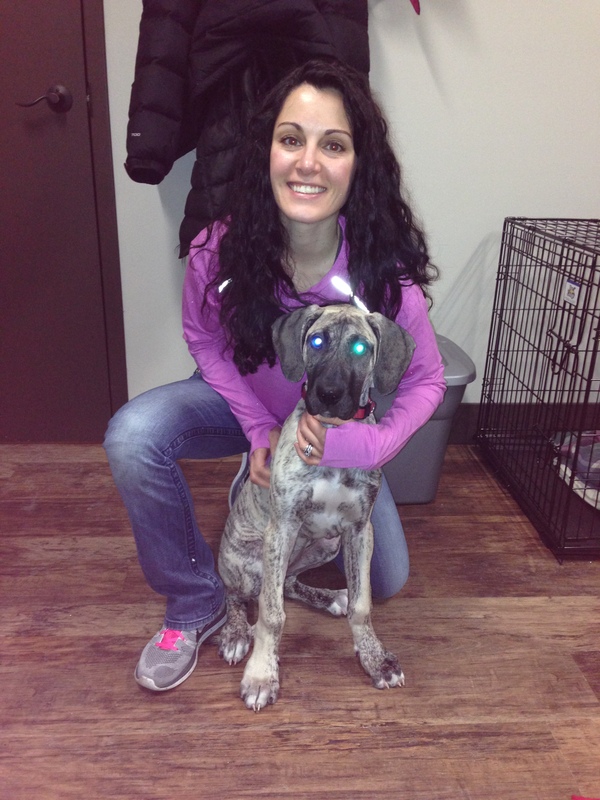 Thanks for chatting with us, Jessica! If you’re a runner in MKE, we’d love to chat with you. Send us an email at keeprunningmke@gmail.com if you’d like to be featured or know someone who should be featured in an upcoming Let’s Get to Know . . . post. This entry was posted in MKE Runners and tagged Jessica Hoepner, MKE Runners, Performance Running Outfitters, Running in MKE. Bookmark the permalink.